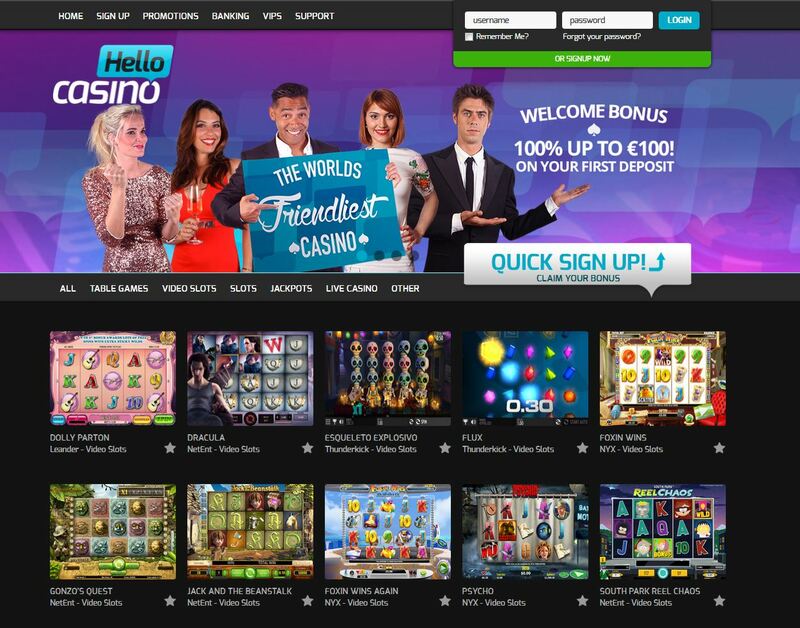 Hello Casino is a new addition as it was introduced in 2014. It’s licensed in Curacao and operated by a company from Cyprus. As soon as you join this online casino you can find an original feel and you will be able to find games coming from both Net Entertainment, NextGen Gaming, GamingLender, Thunderkick, Nyx and Microgaming. The site claims to be “The world’s friendliest casino” and you can tell that from the moment when you visit the site for the first time. The welcome bonus from this online casino is offered at a smaller match rate of only 40%, but at the same time the wagering requirements are a lot softer. As soon as you make your first deposit, you can get a maximum bonus of EUR/GBP/USD 400. There are several other promotions available and these get updated almost each and every month. One of the things that you might not enjoy when joining Hello Casino is the fact that the Net Entertainment progressive jackpots are missing. However you can enjoy the progressives that are available at Microgaming, which by the way are some of the largest in the world. The Hello Casino website is easy to use and functional. All the games are played in your browser and they come from a multitude of software developers, this way you can always enjoy a high diversity. Another great highlight of Hello Casino is the live dealer games. These live games are coming from Net Entertainment and Ezugi. You can start playing: roulette, VIP roulette, blackjack, keno, lottery and common draw blackjack. The live dealer games selection is larger compared to other sites and this way you can get the nice opportunity to watch an HD live stream straight in your browser. This is as close as you can get to the real money games. Hello casino is loaded with plenty of payment methods and making a deposit is always an easy task to complete. You can deposit money via: Visa, MasterCard, iDeal, Giro Pay, Paysafecard, dotpay, Skrill, Neteller, TrustPay, Qiwi Wallet, Webmoney and Bank Wire. The games are available in multiple currencies and this way you can forget about currency conversion fees. The customer support service is available via e-mail, skype, live chat and phone. There is a professional and friendly staff waiting for you and solve any problem you might encounter. The customer support service is backed up by an useful Frequently Asked Questions section on their website that seems to answer any question a new player might have. Overall Hello Casino is excellent for those players who want to enjoy a high number of online casino games that can be played quick and easy in the browser. The withdrawals are always processed very fast thanks to the e-wallet methods and another great plus of this online casino site is that the bonuses hold one of the smallest wagering requirements around. All these are making Hello Casino very friendly indeed and you can always enjoy a huge selection of online casino games.